Holden Sheppard is an award-winning Young Adult author, who grew up in Geraldton, Western Australia. At eighteen, he moved to Perth to pursue his writing career. Holden’s debut YA novel, Invisible Boys, won the 2017 Ray Knoppe Residency Award. We had the pleasure of chatting with Holden about Invisible Boys, his achievements as an young author, and what moves him to work on his writing. Holden also shares his advice for emerging writers. Your debut Young Adult novel, Invisible Boys, won the 2017 Ray Koppe Residency Award and is currently shortlisted for the 2018 T.A.G Hungerford award! Can you tell us a bit about Invisible Boys and what you gained from your writing residency at Varuna, the National Writers’ House? Invisible Boys is a raw and confronting YA novel about three sixteen-year-old boys coming to terms with their sexuality in a town where it is invisible – and so are they. It’s set in my hometown of Geraldton and it tackles big stuff: homosexuality, masculinity, anger and suicide. I wanted it to capture the complexity of rural gay identity, so it’s sometimes dark, sometimes awkward and confused, sometimes fun and light-hearted: in short, what it’s like to be in a teenage boy’s head most of the time! Spending a week at Varuna was an experience I will treasure for life. All of it was amazing: having a studio to work from, the Blue Mountains to roam around in, and uninterrupted time to focus on my novel. But the best part was having dinner-time conversations with the other resident authors, some of whom had buttloads of experience. It was pretty eye-opening to hear their stories of the publishing industry, and also their thoughts and advice on the craft of writing. If I ever get the chance to go back, I hope to go for longer. I started writing at age seven, so I really hope it’s evolved from tales of boarding school and Pokémon fan fiction! Early on, I thought having a strong command of language was what made a successful writer – but it really isn’t. The thing that’s most changed in my writing over the years is that I now use words as a vehicle for my feelings. Writing the first draft of Invisible Boys was a watershed moment: although it’s fiction, it made me confront the trauma of my own teenage years, and that’s when I really found my voice as an author. Rather than constructing a story in a plot-driven way, my writing is now more focused on character and voice. The Johari Window theory claims there are parts of ourselves that others can see, but we can’t – like a blind spot when you’re driving. As writers, our blind spots are the weak points in our writing. I think we have a responsibility to our craft to ask for feedback to find out what’s in our blind spot – like if we overuse adverbs, or our narrators’ voices are too similar, or we keep mentioning the characters’ armpits for no reason (my boyfriend pointed out that I did this in a recent piece – oops!). I’m constantly learning about writing – there is always something new to discover. You are a part of the Centre for Stories project, Bright Lights, No City, where you shared your story about growing up gay in Geraldton. Can you walk us through the process of working with Sisonke Msimang to share your oral story? Bright Lights, No City was a truly awesome project. As a writer, I wanted to push beyond my comfort zone, so I chose oral storytelling instead of writing. Sisonke is a phenomenally talented storyteller – check out her videos and TED Talks on YouTube (and her book, Always Another Country) – so I was a bit awed by her. Sisonke listened to the raw version of my story, and worked with me over several months to craft it into a more powerful experience for the audience. She helped me sort my story’s wheat from its chaff, and spotted opportunities for metaphors and imagery to be heightened. I also had loads of help from Jay Anderson who listened to my story when I needed practice. I took part in the project for catharsis and healing. Understanding my own story, and telling it to a room full of strangers, was absolutely euphoric. But I also shared my story to serve others, particularly gay people in the country who feel isolated. I hope it reaches those who need it most. What are some highlights of your journey as an author so far? Have there been any struggles? The highlights: being shortlisted for the Hungerford; signing with my agent, Haylee Nash; winning the Griffith Review’s 2018 Novella Project competition. Winning the 2017 Ray Koppe Residency Award was a massive highlight, because it was the first external validation I had that Invisible Boys was any good. I’m not ashamed to say that when I got the news, I literally jumped around my home office while listening to Lady Gaga’s “Marry the Night” at full volume. It was a really cool moment. The struggles: too numerous to name. Highlights are not the norm – they are the exception. Like most writers, I am constantly rejected, constantly doubt my abilities and constantly struggle to make ends meet. The worst time was probably 2011-12, when I worked three jobs while completing my Honours in Creative Writing at ECU. I was overworked and still didn’t have enough money to pay the bills, so I was plunged into a cesspit of debt and depression. I eventually burnt out. It wasn’t a fun time. But the only way out is through, as they say. What moves you to work on your writing? Where does an idea usually come from? When I start a new novel, I ask myself what hurts, and make a list of the stuff that’s hurting me right there and then, and then pick the most urgent thing and see what comes of that. Do you have any advice for young adults who are looking to pursue a writing career, but don’t know where to start? Start now. Don’t do what I did. I spent years endlessly “making notes” about my novel ideas. I would sometimes write a page or two of actual text, realise it wasn’t Tolkien or Rowling quality, and give up and go back to making notes. This is a trap. No matter how many notes you jot down, you are still one day going to have to start actually writing your novel, and if your expectation is that your first attempt has to be perfect and publishable, you will be constantly disappointed by your efforts and may end up feeling paralysed by fear and self-doubt. The reality is, even if you are talented, your first attempt is going to be crap. Mine was. My second attempt was also crap. You cannot become a good writer by making notes. You can only become a good writer by actually writing, over and over, until slowly your crap writing becomes slightly less crap. So, start now. Start today. Give yourself permission to write utter horseshit and you will be surprised how liberating that is. Once you have a first draft, you can fix it up, but first just write the damn thing. Also, read On Writing by Stephen King. No matter what stage you are at in your writing journey, this book will change your life. 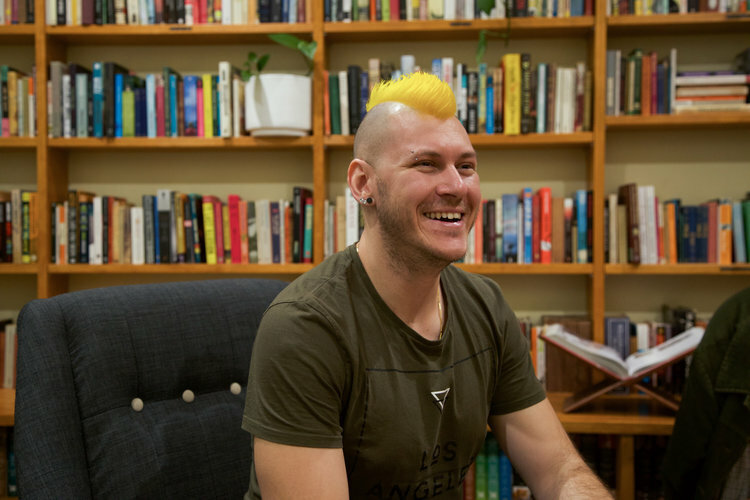 Holden Sheppard’s novella, Poster Boy, won the 2018 Novella Project competition and will be published in Griffith Review in October 2018. In addition to Griffith Review, Holden’s short fiction has been published in Indigo Journal and page seventeen, and he has also written for Ten Daily, the Huffington Post, the ABC, DNA Magazine and FasterLouder. Holden will be on two Festival panel sessions: get your tickets to them here!